A natural herbal concentrate for the stimulation of Earth-element organ function within the Energyvet Pentagram scheme. It acts through a mild excitation of the nervous system, spleen, pancreas, stomach and the cellular recovery system of practically all organs, stimulating these organs or tissues towards increased activity. It generally enhances the animal’s resistance to stress impact. The product increases the secretory activity of the mucosa and of nerve endings. It activates the metabolism of fats. Bioinformation of the product-specific homeopathic type complements and potentiates the effect of the included herbs. The product stimulates the function of organs and tissues of the next element, Metal, i.e. the lungs, colon, connective tissue and skin. It calms down excessive energy and hyperactivity of the preceding element of Fire, i.e. of the heart, arteries, veins, hormonal glands and the small colon. - An adaptogen, for any stress exposure of the animal [Etovet]. - False gestation prophylaxis [Skelevet]. - Supports the production and quality of breast milk [Skelevet]. - Supports the reduction of overweight from subcutaneous fat with water retention [Fytovet]. - Nervous tissue post-traumatic recovery [Imunovet]. - It increases resistance to both external and internal parasites [Epivet]. - The production of tears, of the protective mucus of the colon; it thins mucus in the lungs [Fytovet]. - Articular fluid production and articular cartilage recovery [Skelevet]. - Deposited fat burning (obesity, liver steatosis, cerebral sclerosis) [Omegavet]. - Secretory activity of the skin and mucosa and its cellular recovery (elasticity, revitalisation) [Fytovet]. - Hair, scale, and feather molting and revitalisation [Skelevet]. - Colon secretion (in cases of dry-stool constipation) [Cytovet]. - New cell production in practically all tissues [Imunovet]. - Cellular immunity enhancement (frequent infections, occurrence of dermal denticles) [Imunovet, Omegavet]. - Excessive heart activity (accelerated, hard and irregular pulse) [Fytovet]. - Prevention and long-term treatment of post-stroke and post-myocardial infarction conditions [Omegavet]. - Excessive blood supply of the mucosa (non-infectious) [Skelevet]. 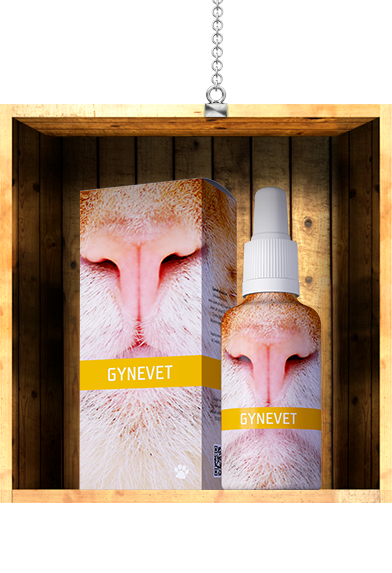 - Hormonal imbalance (with harmonising effect – particularly on stress hormones) [Fytovet, Omegavet]. - Inflammations affecting the small intestine and duodenum [Cytovet]. Herbal extract 82.6% (Lamium album, Calendula officinalis, Fucus vesiculosus, Geranium robertianum, Glycyrrhiza glabra, Imperatoria ostruthium, Potentilla anserina, Trifolium pratense, Galega officinalis, Galium verum, Robinia pseudoacacia, Alchemilla vulgaris, Foeniculum vulgare), sorbitol – thickener, microcrystalline cellulose – thickener, water, xanthan – thickener, grapefruit extract – preservative, potassium sorbate – preservative, mix of essential oils 0.12%, bioinformation for Gynevet. Do not administer in cases of gastric ulcers, inflammations of the nervous tissue, pancreas or spleen. Do not exceed the recommended daily dose! Ensure sufficient intake of water in the course of product usage. Not suitable for gestating females. Keep out of reach of children! Gynevet offers a number of various applications. I was surprised to see how well it helps to adjust weight in obese dogs.